You can migrate your databases and data to SQL Server vNext CTP1 running on Linux. The method you choose to use depends on the source data and your specific scenario. The following sections provide best practices for various migration scenarios. If you would like to read How to Install SQL Server on Red Hat or Ubuntu Linux or How to Configure and Manager SQL Server on Red Hat or Ubuntu Linux. If you want to migrate SQL Server databases on Windows to SQL Server vNext on Linux, the recommended technique is to use SQL Server backup and restore. Create a backup of the database on the Windows machine. Transfer the backup file to the target SQL Server Linux machine. Restore the backup on the Linux machine. 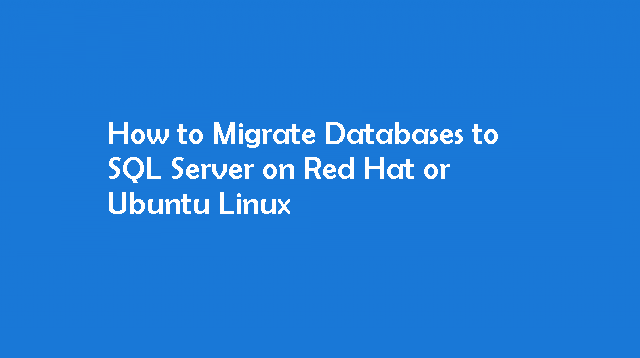 You can migrate databases on other database systems to SQL Server vNext on Linux. This includes Microsoft Access, DB2, MySQL, Oracle, and Sybase databases. In this scenario, use the SQL Server Management Assistant (SSMA) to automate the migration to SQL Server on Linux. There are also techniques for importing raw data. You might have structured data files that were exported from other databases or data sources. In this case, you can use the bcp tool to bulk insert the data. Or you can run SQL Server Integration Services on Windows to import the data into a SQL Server database on Linux. SQL Server Integration Services enables you to run more complex transformations on the data during the import. This tutorial assumes that you have installed SQL Server vNext CTP1 and the SQL Server Tools on your target Linux server. 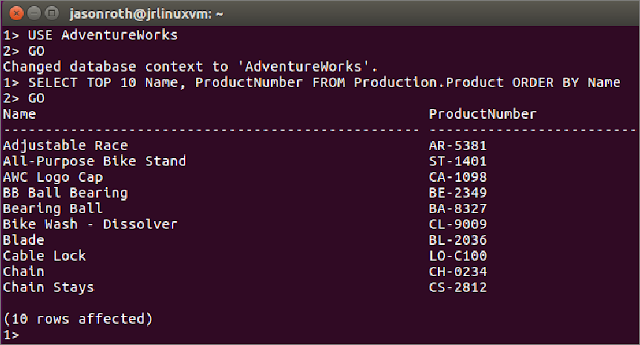 Although you can use the same steps to restore any database, the AdventureWorks sample database provides a good example. It comes as an existing database backup file. To restore a database to SQL Server on Linux, the source backup must be taken from SQL Server 2014 or SQL Server 2016. The backup SQL Server build number must not be greater than the restore SQL Server build number. https://msftdbprodsamples.codeplex.com/downloads/get/880661 and download the Adventure Works 2014 Full Database Backup.zip. Although this tutorial demonstrates backup and restore between Windows and Linux, you could also use a browser on Linux to directly download the AdventureWorks sample to your Linux machine. Open the zip file, and extract the AdventureWorks2014.bak file to a folder on your machine. To restore the database, you must first transfer the backup file from the Windows machine to the target Linux machine. Download an open source Bash shell, such as PuTTY. Or, on Windows 10, use the new built-in Bash shell (beta). Or, if you work with Git, use the Git Bash shell. Open a Bash shell (terminal) and navigate to the directory containing AdventureWorks2014.bak. Use the scp (secure copy) command to transfer the file to the target Linux machine. The following example transfers AdventureWorks2014.bak to the home directory of user1 on the server named linuxserver1. In the previous example, you could instead provide the IP address in place of the server name. There are several alternatives to using scp. One is to use Samba to setup an SMB network share between Windows and Linux. For a walkthrough on Ubuntu, see How to Create a Network Share Via Samba. Once established, you can access it as a network file share from Windows, such as \\machinenameorip\share. At this point, the backup file is on your Linux server. Before restoring the database to SQL Server, you must place the backup in a subdirectory of /var/opt/mssql. Open a Terminal on the target Linux machine that contains the backup. Create a new backup directory. The -p parameter does nothing if the directory already exists. Move the backup file to that directory. In the following example, the backup file resides in the home directory of user1. Change the command to match the location of AdventureWorks2014.bak on your machine. To restore the backup, you can use the RESTORE DATABASE Transact-SQL (TQL) command. The following steps use the sqlcmd tool. If you haven’t install SQL Server Tools, see Install SQL Server on Linux. In the same terminal, launch sqlcmd. The following example connects to the local SQL Server instance with the SA user. Enter the password when prompted or specify the password with the -P parameter. After connecting, enter the following RESTORE DATABSE command, pressing ENTER after each line. The example below restores the AdventureWorks2014.bak file from the /var/opt/mssql/backup directory. You should get a message the database is successfully restored. Verify the restoration by first changing the context to the AdventureWorks database. Run the following query that lists the top 10 products in the Production.Products table. This topic shows how to the sqlpackage tool to export and import databases to SQL Server vNext CTP1 on Linux. You can use the sqlpackage command line utility with Microsoft SQL Server running on-premises or in the cloud, on Linux, Windows or Docker and from Azure SQL Database. The sqlpackage command line utility is particularly useful when you wish to import a database from Azure SQL Database to SQL Server on Linux or vice-versa. This topic shows how to use SQL Server Management Studio (SSMS) to export and import a database on SQL Server vNext CTP1 on Linux. SSMS is a Windows application, so use SSMS when you have a Windows machine that can connect to a remote SQL Server instance on Linux. Start SSMS by typing Microsoft SQL Server Management Studio in the Windows search box, and then click the desktop app. Connect to your source database in Object Explorer. The source database can be in Microsoft SQL Server running on-premises or in the cloud, on Linux, Windows or Docker and Azure SQL Database or Azure SQL Data Warehouse. In the export wizard, click Next, and then on the Settings tab, configure the export to save the BACPAC file to either a local disk location or to an Azure blob. By default, all objects in the database are exported. Click the Advanced tab and choose the database objects that you wish to export. The *.BACPAC file is successfully created at the location you chose and you are ready to import it into a target database. Connect to your target server in Object Explorer. The target server can be Microsoft SQL Server running on-premises or in the cloud, on Linux, Windows or Docker and Azure SQL Database or Azure SQL Data Warehouse. To create the database in your target server, specify a BACPAC file from your local disk or select the Azure storage account and container to which you uploaded your BACPAC file. Provide the New database name for the database. If you are importing a database on Azure SQL Database, set the Edition of Microsoft Azure SQL Database (service tier), Maximum database size, and Service Objective (performance level). Click Next and then click Finish to import the BACPAC file into a new database in your target server. The *.BACPAC file is imported to create a new database in the target server you specified. This topic introduces SQL Server Migration Assistant (SSMA) that helps you easily migrate databases to SQL Server vNext CTP1 on Linux from Microsoft Access, DB2, MySQL, Oracle and Sybase. SSMA is a Windows application, so use SSMA when you have a Windows machine that can connect to a remote SQL Server instance on Linux. This topic shows how to use the bcp command line utility to bulk copy data between an instance of SQL Server vNext CTP1 on Linux and a data file in a user-specified format. You can use bcp to import large numbers of rows into SQL Server tables or to export data from SQL Server tables into data files. Except when used with the queryout option, bcp requires no knowledge of Transact-SQL. The bcp command line utility works with Microsoft SQL Server running on-premises or in the cloud, on Linux, Windows or Docker and Azure SQL Database and Azure SQL Data Warehouse. bcp is part of the SQL Server command-line tools, which are not installed automatically with SQL Server on Linux. If you have not already installed the SQL Server command-line tools on your Linux machine, you must install them. In this tutorial, you will create a sample database and table on the local SQL Server instance (localhost) and then use bcp to load into the sample table from a text file on disk. Let's start by creating a sample database with a simple table that will be used in the rest of this tutorial. On your Linux box, open a command terminal. Copy and paste the commands below into the terminal window. These commands use the sqlcmd command line utility to create a sample database (BcpSampleDB) and a table (TestEmployees) on the local SQL Server instance (localhost). Remember to replace the username and as necessary before running the commands. sqlcmd -S localhost -U sa -P  -Q "CREATE DATABASE BcpSampleDB;"
sqlcmd -S localhost -U sa -P  -d BcpSampleDB -Q "CREATE TABLE TestEmployees (Id INT IDENTITY(1,1) NOT NULL PRIMARY KEY, Name NVARCHAR(50), Location NVARCHAR(50));"
Copy and paste the command below in your terminal window. We will use the built-in cat command to create a sample text data file with 3 records save the file in your home directory as ~/test_data.txt. The fields in the records are delimited by a comma. Copy and paste the commands below into the terminal window. This command uses bcp to connect to the local SQL Server instance (localhost) and import the data from the data file (~/test_data.txt) into the table (TestEmployees) in the database (BcpSampleDB). Remember to replace the username and as necessary before running the commands. We are not specifying a custom row terminator in this example. Rows in the text data file were correctly terminated with newline when we used the cat command to create the data file earlier. You can verify that the data was successfully imported by running the command below in your terminal window. Remember to replace the username and as necessary before running the command. sqlcmd -S localhost -d BcpSampleDB -U sa -P  -I -Q "SELECT * FROM TestEmployees;"
In this tutorial, you will use bcp to export data from the sample table we created earlier to a new data file. Copy and paste the commands below into the terminal window. These commands use the bcpcommand line utility to export data from the table TestEmployees in the in the database BcpSampleDB to a new data file called ~/test_export.txt. Remember to replace the username and as necessary before running the command. You can take backups of databases from SQL Server vNext CTP1 on Linux with the same tools as other platforms. On a Linux server, you can use sqlcmd to connect to the SQL Server and take backups. From Windows, you can connect to SQL Server on Linux and take backups with the user interface. The backup functionality is the same across platforms. In the following example sqlcmd connects to the local SQL Server instance and takes a full backup of a user database called demodb. sqlcmd -H localhost -U SA -Q "BACKUP DATABASE [demodb] TO DISK = N'var/opt/mssql/data/demodb.bak' WITH NOFORMAT, NOINIT, NAME = 'demodb-full', SKIP, NOREWIND, NOUNLOAD, STATS = 10"
Processed 296 pages for database 'demodb', file 'demodb' on file 1. Processed 2 pages for database 'demodb', file 'demodb_log' on file 1. BACKUP DATABASE successfully processed 298 pages in 0.064 seconds (36.376 MB/sec). In the following example, sqlcmd connects to the local SQL Server instance and takes a tail-log backup. After the tail-log backup completes, the database will be in a restoring state. sqlcmd -H localhost -U SA -Q "BACKUP LOG [demodb] TO  DISK = N'var/opt/mssql/data/demodb_LogBackup_2016-11-14_18-09-53.bak' WITH NOFORMAT, NOINIT,  NAME = N'demodb_LogBackup_2016-11-14_18-09-53', NOSKIP, NOREWIND, NOUNLOAD,  NORECOVERY ,  STATS = 5"
In the following example sqlcmd connects to the local instance of SQL Server and restores a database. sqlcmd -H localhost -U SA -Q "RESTORE DATABASE [demodb] FROM  DISK = N'var/opt/mssql/data/demodb.bak' WITH  FILE = 1,  NOUNLOAD,  REPLACE,  STATS = 5"
You can use SSMS from a Windows computer to connect to a Linux database and take a backup through the user-interface. Use the latest version of SSMS to connect to SQL Server. To download and install the latest version, see Download SSMS. The following steps walk through taking a backup with SSMS. Start SSMS and connect to your server in SQL Server vNext CTP1 on Linux. In the Backup Up Database dialog, verify the parameters and options, and click OK.
SQL Server completes the database backup. The following steps walk you through restoring a database with SSMS. Under Source click Device: and then click the ellipses (...). Locate your database backup file and click OK. Under Restore plan, verify the backup file and settings. Click OK.
SQL Server restores the database.